The Admit card has been issued by the Indian Coast Guard for the Post of Navik (Domestic Branch) recruitment 2018. The admit cards are available on the website. 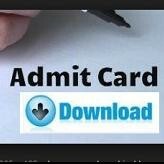 Those candidates who have applied for this recruitment exam can download admit card from below given link. The recruitment exam is in November only. Selection Process: Selection will be based on written exam and physical fitness test. (a) Pay & Allowances. Starting Basic Pay Scale for Navik (DB) is ` 21700/- (Pay Level-3), plus Dearness Allowance and other allowances based on nature of duty/place of posting as per the regulation enforced time to time. JOIN INDIAN COAST GUARD (Ministry Of Defence) as Navik (Domestic Branch) 10th Entry- 01/2019 Batch Application will be accepted 'ONLINE’ from 15 to 29 Oct 2018. (b) Promotion. Promotion prospects exist up to the rank of Pradhan Adhikari with pay scale ` 47600/- (Pay level 8) with Dearness Allowance. - Ration and clothing as per rules in vogue. Free medical treatment for self and family including dependent parents. - Government accommodation for self & family on the nominal license fee. - 45 days Earned leave and 08 days Casual leave every year with Leave Travel Concession (LTC) for self, family and dependent parents as per Govt. rules. - Contributory Pension Scheme and Gratuity on retirement. - Canteen and various loan facilities. - ECHS medical facilities post-retirement.